Image caption It's not just Santa that works at Christmas, many IT workers do too. There's no doubt that the web and the growing roster of gadgets that use it have helped to create the always-on, 24/7 world of the 21st Century. What that means is that, no matter the day or hour, some people have to be on a phone line, in a chat room or laying down the infrastructure to keep the data flowing. Rather than kicking back these folk will have to keep the power on during the break. Lee Waghorn is a hydrographic surveyor working for submarine cable consultancy Pelagian. He is currently on a cable ship off the cost of Banjul, Gambia. Cable ships typically cost about £50,000 per day to run so work cannot halt for public holidays. Surveying and cable laying goes on 24 hours a day, 365 days a year. As a result, said Mr Waghorn, Christmas day is like any other. "A typical Christmas day consists of going about the normal daily tasks of marine data collection: mapping the seabed with echo sounders and scanning sonar to determine the composition and ruggedness of the seabed terrain. This data is used to determine the safest route for the submarine cable." "Daily meetings are held to discuss the project and then there's all the paperwork to tackle for the day," he said. Given the workload, food and entertainment are important to maintain morale of the 30-strong crew that is made up of many different nationalities including English, French, Italian, American, Indonesian, Filipino, Chinese and Hong Kong Chinese workers. "The galley staff work their hardest at this time, preparing a good variety of food. Christmas dinner here is usually cooked on a spit roast on the deck in the warmer climates, and with continuous working we try and get as many people to dine at the same time as we can." "The crews are generally a mixture of nationalities, which could consist of various religious beliefs as well. 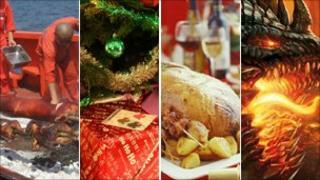 But everyone enjoys the occasion as it feels more like a big barbecue party than Christmas." For Mr Waghorn, the Christmas meal is likely to be goat rather than turkey but toasts are likely to be raised to the framed picture of the Queen found in the mess room of every British cable ship. Sadly, he said, the Christmas celebrations do not last long. The demanding schedule of ship-board life means no time for a post-prandial nap. "Once the food has been eaten, everyone will continue to go about their normal daily duties to keep the project running smoothly," he said. Gadgets are likely to feature heavily in Christmas stockings this year and many people may struggle to get them working after they are unboxed. Fran Sorci is an agent for Geek Squad who will be helping those who get the gift of gadgets get them working during the festive season. It's common, he said, for those that get a gadget to really struggle when it comes to getting it working. "They might have hinted to relatives about a gadget they have just seen and think is really cool," he said. "Then they are stuck trying to work out how to actually use it." Older people are much more likely to ask for help, said Agent Sorci. "Kids just sit down and play with the gadget then, if it breaks, they work out how to fix it," he said. "That's just how they're brought up these days." "The parents will be more wary about breaking it, they try and work it out much more slowly," he added. And, he added, the more expensive a gadget is, the more likely parents are to take charge when it comes to wiring it up. What also trips many people up is that few devices, be they consoles or cameras, stand alone anymore. Many have to be connected to a wi-fi network, hooked up to a TV or accessed by a computer. It's only toys, he said, that maintain a lordly isolation. At this time of year, he said, cables cause all kinds of problems. Usually because people lack the right one or cannot find where to plug it in. Some of the best call outs, he said, are for people who have bought or been given gadgets that help them keep in touch at Christmas. "A few times I've set up new e-mail and Skype accounts for people if they have been given webcams and they want to use them to speak to long-distance relatives at Christmas," he said. Although in cases like this, he said gadgets are undoubtedly a boon they often do nothing but add to the stress of the Christmas season. "A simple gift can turn into a nightmare," he said. While many will spend time with family this Christmas lots of people are likely to go online on 25 December to keep up with the virtual friends they have made on social networks and in games. One person who will be answering the queries of some of those folk who are online is "Dani", a moderator and project team leader at Emoderation, which provides staff for those online forums, games and chat rooms for firms as diverse as ESPN, the GLA and Smirnoff. "I'll be on duty all day," said Dani, who asked to conceal her full name. Dani works from home but that means, even on Christmas day, that she is never far away from the computer she uses to watch over forums and stay in touch with colleagues. She will get a couple of hours free for Christmas lunch but will have no time to linger to catch the Queen's speech. "It's quite important that we are here," she said. "You never know if people are going to come on and ask questions." Working at home has its perils, she said, as one year she had to cope after a colleague set a tea towel on fire while making the Christmas dinner. She also remains philosophical about the fact that some of the people she and her colleagues will be helping with might be rather too full of Christmas cheer. "It's all part of the job," she said. Finally, while some are working on Christmas many dedicated gamers will be playing on the day. Including Andy Amos, one of the officers of the World of Warcraft (WoW) Revolution guild. Mr Amos said Revolution counts itself as a "casual" guild so its roster of raiding and other in-game activities is not as full as other more dedicated groups. "Despite this," he said. "with it being a national holiday we tend to have more people online over this time, and with the recent release of Cataclysm our online numbers will be higher still." Cataclysm is the latest expansion for WoW that sees the warcraft world ripped up by the emergence of the dragon Deathwing. "Being strictly an over 18 guild a lot of our members will have full time jobs and don't live with their parents, and as a result getting large groups together to raid is usually tricky, what with Christmas parties, Christmas shopping and visiting relatives," he said. The Cataclysm expansion has triggered a fresh round of character creation, he said, so few of the characters people play are a high enough level to go on raids just yet. Raids involve getting lots of people together to tackle the toughest in-game enemies for the best loot. As a result, he said, time over the holidays is likely to be spent getting the gear so everyone is well prepared for raids in the New Year. "Overall Christmas will be about enjoying the game with good people, good banter, and at a decent standard - pretty much the same as every day in Revolution, just with a few mince pies thrown in."